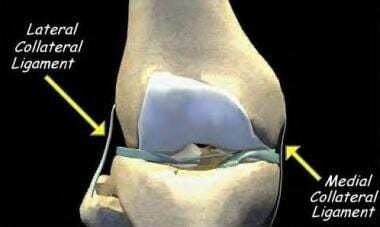 Medial collateral ligament (MCL) and lateral collateral ligament (LCL) injuries of the knee are common. In fact, injury to the MCL is the most common ligamentous knee injury. The MCL and LCL provide restraint to valgus and varus angulation of the knee, respectively. The MCL has superficial and deep components. The superficial MCL fibers attach proximally to the medial femoral epicondyle and distally to the medial aspect of the tibia, approximately 4 cm distal to the joint line. The deep MCL fibers originate from the medial joint capsule and are attached to the medial meniscus. The medial and lateral collateral ligaments of the knee. Courtesy of Randale Sechrest, MD, CEO, Medical Multimedia Group. Medial collateral ligament (MCL) and lateral collateral ligament (LCL) injuries are caused primarily by valgus and varus stress (respectively) to the knee joint. Injuries also can occur to both ligaments with excessive lateral rotation of the knee. There is no known racial predilection for medial collateral ligament (MCL) and lateral collateral ligament (LCL) injuries. Age patterns for medial collateral ligament (MCL) and lateral collateral ligament (LCL) injuries are bimodal, with the highest incidence rates found in individuals aged 20-34 years and in persons aged 55-65 years. Nonetheless, MCL and LCL injuries can occur at any age. Fu FH, Harner CD, Johnson DL, et al. Biomechanics of knee ligaments: basic concepts and clinical application. Instr Course Lect. 1994. 43:137-48. [Medline]. Amiri S, Cooke D, Kim IY, et al. Mechanics of the passive knee joint. Part 2: interaction between the ligaments and the articular surfaces in guiding the joint motion. Proc Inst Mech Eng [H]. 2007 Nov. 221(8):821-32. [Medline]. National Collegiate Athletic Association. NCAA Injury Surveillance System. 1999-2000. [Full Text]. Yawn BP, Amadio P, Harmsen WS, et al. Isolated acute knee injuries in the general population. J Trauma. 2000 Apr. 48(4):716-23. [Medline]. Quarles JD, Hosey RG. Medial and lateral collateral injuries: prognosis and treatment. Prim Care. 2004 Dec. 31(4):957-75, ix. [Medline]. Dugan SA. Sports-related knee injuries in female athletes: what gives?. Am J Phys Med Rehabil. 2005 Feb. 84(2):122-30. [Medline]. El-Dieb A, Yu JS, Huang GS, et al. Pathologic conditions of the ligaments and tendons of the knee. Radiol Clin North Am. 2002 Sep. 40(5):1061-79. [Medline]. Pimentel L. Orthopedic trauma: office management of major joint injury. Med Clin North Am. 2006 Mar. 90(2):355-82. [Medline]. Strayer RJ, Lang ES. Evidence-based emergency medicine/systematic review abstract. Does this patient have a torn meniscus or ligament of the knee?. Ann Emerg Med. 2006 May. 47(5):499-501. [Medline]. Crotty JM, Monu JU, Pope TL Jr. Magnetic resonance imaging of the musculoskeletal system. Part 4. The knee. Clin Orthop Relat Res. 1996 Sep. 288-303. [Medline]. Beall DP, Googe JD, Moss JT, et al. Magnetic resonance imaging of the collateral ligaments and the anatomic quadrants of the knee. Radiol Clin North Am. 2007 Nov. 45(6):983-1002, vi. [Medline]. Hastings DE. The non-operative management of collateral ligament injuries of the knee joint. Clin Orthop. 1980 Mar-Apr. (147):22-8. [Medline]. Wahl CJ, Nicandri G. Single-Achilles allograft posterior cruciate ligament and medial collateral ligament reconstruction: a technique to avoid osseous tunnel intersection, improve construct stiffness, and save on allograft utilization. Arthroscopy. 2008 Apr. 24(4):486-9. [Medline]. Marx RG, Hetsroni I. Surgical technique: medial collateral ligament reconstruction using Achilles allograft for combined knee ligament injury. Clin Orthop Relat Res. 2012 Mar. 470(3):798-805. [Medline]. [Full Text]. Schein A, Matcuk G, Patel D, Gottsegen CJ, Hartshorn T, Forrester D, et al. Structure and function, injury, pathology, and treatment of the medial collateral ligament of the knee. Emerg Radiol. 2012 Dec. 19(6):489-98. [Medline]. Atoun E, Debbi R, Lubovsky O, Weiler A, Debbi E, Rath E. Arthroscopic trans-portal deep medial collateral ligament pie-crusting release. Arthrosc Tech. 2013 Feb. 2(1):e41-3. [Medline]. [Full Text]. Medvecky MJ, Zazulak BT, Hewett TE. A multidisciplinary approach to the evaluation, reconstruction and rehabilitation of the multi-ligament injured athlete. Sports Med. 2007. 37(2):169-87. [Medline]. Yoshiya S, Kuroda R, Mizuno K, et al. Medial collateral ligament reconstruction using autogenous hamstring tendons: technique and results in initial cases. Am J Sports Med. 2005 Sep. 33(9):1380-5. [Medline]. Dong J, Wang XF, Men X, et al. Surgical Treatment of Acute Grade III Medial Collateral Ligament Injury Combined With Anterior Cruciate Ligament Injury: Anatomic Ligament Repair Versus Triangular Ligament Reconstruction. Arthroscopy. 2015 Jun. 31 (6):1108-16. [Medline]. King AH, Krych AJ, Prince MR, Pareek A, Stuart MJ, Levy BA. Surgical Outcomes of Medial Versus Lateral Multiligament-Injured, Dislocated Knees. Arthroscopy. 2016 Sep. 32 (9):1814-9. [Medline].